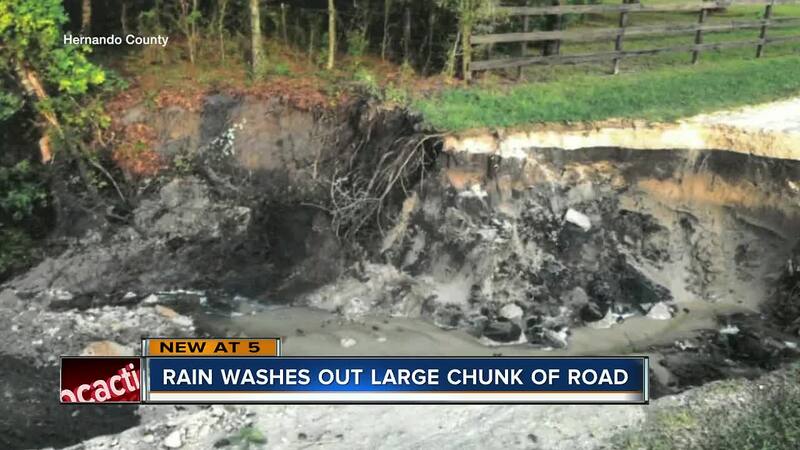 HERNANDO COUNTY, Fla. — Hernando County residents were isolated in their homes after a chunk of road washed out on Thursday. According to county workers, heavy rain caused the hole in the southeast corner of the county on Hampstead Dr. just west of I-75. The gaping hole, nearly 30 ft. wide and 12 ft. , swallowed a portion of the road and grassy pasture next to it. Residents who live further down Hampstead Dr. were trapped from leaving until the hole was filled. "I was shocked to know that in a six-hour period our entire road could just wash away," said Sandie Nichols, one of the residents who isolated in her home because of the hole. County workers quickly responded on Thursday night filling in the hole with asphalt milling. But neighbors say they want more done like installing more culverts and guard rails. "Something to keep it secure and safe underneath so it doesn’t keep washing out," said Nichols. "If we have a storm today this will be gone," said neighbor Mike Long who took video of the milling starting to wash away after another heavy rain. The county says that further repair work is expected.